I am not a gardener. Before living in urban Massachusetts I grew up in New York City. The red clay that passed as soil in our yard was not only impossible to dig through; it was all but impermeable. Flowers and plants grew, but only with a lot of hard work and persistence. On the boardwalk, English isn’t the first language you expect to hear; instead there’s a mix of a hundred different voices and tongues from all over the world. As I hear them speak words I don’t understand, I am reminded that they, too, are transplanted, and perhaps they come here too to find a bit of home. All content on this site is the intellectual property of "The Orris" journal. For information regarding re-publishing of articles or images, contact theorrisjournal[at]gmail.com. Currently seeking editors, graphic designers, and web developers. If interested in collaborating with us, contact theorrisjournal[at]gmail.com. 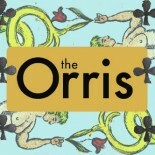 The Orris is currently accepting offers for advertising and sponsorship. For more information, contact theorrisjournal[at]gmail.com.